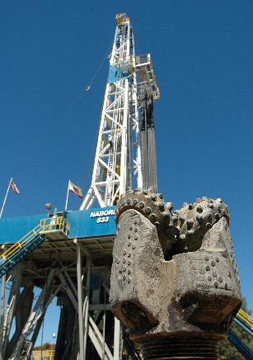 Towering 56 meters above the ground, a drill rig in Parkfield, Calif., sends a bit through miles of earth below. In contrast to what the rig was designed for, however, personnel running the operation did not expect to hit oil. 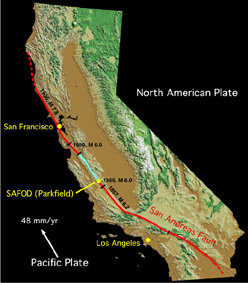 Rather, they expected to hit the source of some of California's numerous earthquakes: the San Andreas Fault. The drilling is part of the San Andreas Fault Observatory at Depth (SAFOD) project, the first of its kind to look directly at an active fault to learn about the mechanics of earthquake generation. And SAFOD reached a significant milestone last week when, after two summers of near-constant drilling, they hit the fault. Now, researchers are working to implement monitoring systems within the permanent underground observatory that they hope will provide critical information for future earthquake studies. On Aug. 2, scientists drilled down about 3 kilometers and reached the San Andreas Fault. The drilling bit in the foreground was the 12th of 14 used this summer in the SAFOD project to drill through the fault and establish a permanent earthquake observatory. All images are courtesy of EarthScope. In the past, seismologists conducted earthquake research only at the surface, says Mark Zoback, a geophysics professor at Stanford University, and co-principal investigator of SAFOD along with Stephen Hickman and William Ellsworth of the U.S. Geological Survey (USGS). Yet to be tested were fundamental theories of earthquake mechanics such as the width and composition of active fault zones at depth, and what pressures, stresses and chemical processes are responsible for fault activity. Collecting this information via SAFOD could aid scientists in determining whether earthquakes are predictable. "The problem is, in the absence of hard data about the fault at depth, you can almost say that every idea is a good idea, even when they're not," Zoback says. In hopes of gathering the missing data from the fault itself, the SAFOD project commenced drilling operations in June 2004. "It's a great voyage of discovery, almost like a Jules Verne novel," says Charna Meth of EarthScope. SAFOD is one component of the National Science Foundation's EarthScope program, being carried out in collaboration with USGS, to study the North American Plate (see Geotimes, April 2002). But not just any location along the 1,287-kilometer-long (800-mile) San Andreas Fault  which runs through California and marks the boundary between the Pacific and North American plates  could have provided optimal drilling and experimental conditions. SAFOD scientists agreed upon a unique segment in Parkfield, Calif., about halfway between Los Angeles and San Francisco. This 25-kilometer-long segment gained fame for seemingly regular earthquakes, with at least six magnitude-6.0 events since 1857, including one last September. As a result, Parkfield is the most extensively instrumented fault section in the world and has been the site of several earthquake prediction experiments (see Geotimes, March 2005). This map depicts the "locked" portion of the San Andeas Fault (red) and the "creeping" segment (blue). 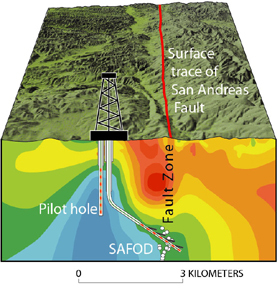 SAFOD scientists drilled at Parkfield, Calif., where these two fault types meet. The fault segment's smaller and more frequent earthquakes, however, led SAFOD project scientists to drill at Parkfield. The site borders a section of the fault that constantly "creeps" at a rate of about 2 centimeters per year due to small and constant stresses, and a section that remains locked. The transition region produces patches of repeating "microearthquakes," as opposed to the larger and less frequent earthquakes of the locked regions. SAFOD researchers used the frequent microearthquakes as a "guide star" to find the location of the fault before drilling, Zoback says. And regular tremors will also produce more raw data for experiments. The drilling crew expected to reach the fault zone sooner than Aug. 2. "Where is it?" Zoback says researchers asked. But when drilling rates suddenly quickened and carbon dioxide and other gas levels increased  probably because the broken-up nature of the fault allows the gas to more readily escape  they knew that they had reached the San Andreas Fault, Zoback says. After two summers, 14 drill bits, and two potential project-ending drill jams, the final borehole traced vertically downward for 2.5 kilometers in the Pacific Plate, and then shifted to a 55 degree angle for the remaining 0.7 vertical miles across the tens of meters of fault, and stopped at the hard rocks of the North American Plate. "We were pleased, we were relieved to have finally done it," Zoback says, "and yet there wasn't the exaltation that you might have thought, simply because this is the first of many challenges." Scientists drilled a pilot hole in summer 2002 and placed instruments inside (red dots) that helped determine the approximate locations of microearthquakes (white dots). This information helped scientists decide where to drill the borehole that crosses the fault. The horizontal black lines represent the four cores to be removed in summer 2007. The crew must now make geophysical measurements and obtain small "side-wall" cores before they line the borehole with steel and cement for long-term stability. Then, instrumentation will be lowered into the hole as part of the process of building a geophysical observatory directly within the active fault trace. At the same time, preparations will be made for drilling that will resume in summer 2007, when the scientists plan to reenter the main borehole and remove four 250-meter cores from its side. Finally they will deploy an array of instruments including seismometers and deformation sensors. "By coring into both kinds of faults in 2007, we will be able to actually address questions of how the composition of rock in the fault will affect its behavior," Zoback says. When completed, the observatory will collect data for at least 20 years. "Once we put in the instrumentation, we're going to have an observatory where we can watch earthquakes work and we're going to answer questions such as whether earthquakes are predictable," Zoback says. "What we've done will enable new kinds of science to be done for decades. That's what we feel so good about."